Slots Lotty is the bright face of Slots Capital Casino. She sports a 1950’s look from her T-bird glasses to her Lucy “Do”. Inside her casino is a wealth of super fun modern games, promotions, bonuses – including the ever popular no deposit bonus codes – and the finest technology around! Read our Slots Capital Casino Review to learn more. DO NOT miss the new slot Smoking Gun at Slots Capital! And get a 250% match bonus now til March 31! Check out Slots Capital for All the FUN, ALL the TIME! Slots Capital offers a thoroughly enjoyable gaming experience. They have fantastic games and, to keep the fun going, they also have an enormous assortment of excellent daily bonuses and other promotions such as comp points and the VIP Club. The generally low rollover on bonuses makes them a great way to add to your account. Before you can take advantage of a single daily bonus, you need to register at Slots Capital. You can register and play games online for free for as long as you’d like. This is an online casino not a land based casino where space restrictions and operating expenses make it impossible to offer free casino play. At Slots Capital Casino, there is always enough space for the games you want to play. That means that the casino can allow free play indefinitely. 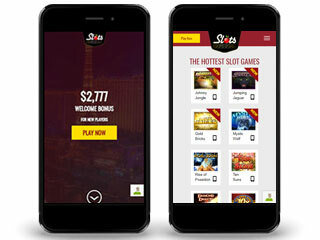 When you do decide to make a deposit, you can use either the exclusive package for new players through SlotsPlayCasino.com or the casino’s own offer. Through SPC, you will get a 400% matching bonus for up to $4000. Through the casino directly, the new player bonus is actually two bonuses wrapped into one deal: it begins with a $10 no deposit bonus code followed up with a deposit bonus up to $2777. This is a player’s obligation to bet a factor of the bonus he or she has accepted from the casino. Rollover has different names at different casinos but they are all the same idea: casinos cannot simply give away bonus money. In a sense, players have to “earn” them. The big key is that some casinos make you bet as much as 60x your bonus. At Slots Capital Casino, the rollover requirement is generally around 30x and for the Sunday bonus promotion, the rollover is just 20x and a daily 65% bonus has a 16x rollover rate! These are really low rates – a huge advantage to the player! It might surprise you to see this as a separate heading in an online casino review especially if you are young and don’t wear reading glasses. For the millions of online gamers who are a bit older and who do use reading glasses, the font size on an online casino is extremely important. Here is just another area where Slots Capital Casino excels; their pages are very readable with somewhat larger fonts, excellent color contrast between background and text, and short lines so readers can easily read across the line. Slots Lotty started the blog in April of last year. She tells you about the new games coming to Slots Capital and how to get special bonus codes for those games. Slots Lotty promises that the blog will continue to evolve with news and special promotions so click on the blog link often. It will keep you informed about what’s going on at the casino, and give you a good idea of the lengths the casino will go to make their players happy. This is possibly the most important aspect of online gaming. The actual games have to be great, of course, but the safety of your money is paramount. Slots Capital uses the exact same type of encryption software that the big banks and investment firms use for their online operations. Now that you’re satisfied that your money will be well protected at Slots Capital, you probably want to know how to deposit and withdraw. The casino offers several deposit methods, primarily credit cards and ewallets. The latter banking method was developed especially for online transactions. Today, billions of goods and services are bought and sold online and most transactions go through an ewallet. Withdrawals are effected within 48-72 hours after the request has been made. You might have to provide some proof that you are you to receive the withdrawal. Some players object to this extra layer of precaution on the casino’s part but it is done throughout the online casino industry as an extra step for players’ protection. Slots Capital, like all top level online casinos, uses a Random Number Generator (RNG) to create the result of any spin in slots or roulette or any hand in card games. The RNG is your guarantee that the games are fair. Every top casino has its RNG checked out by an independent company every six months or so to make sure that it in proper working condition. Slots Capital is regularly tested by an impartial firm to determine that the RNG is working properly, that the encryption software is still state-of-the-art, that withdrawals are expedited quickly, and that all calls are taken quickly and all questions answered in a timely fashion. In the “old days” you had to download an online casino to your computer’s hard drive. That was when there were far fewer online casinos and game developers. Today there are thousands of online casinos and over 150 game developers. This means that it is impossible to put all of the thousands of games available on a single online casino. Players who want to sample the best games from a number of providers can do so by registering at Slots Capital and playing in instant play mode. The big change in instant play mode at all the online casinos that offer it is in the graphics, animation, and sound quality. Technology continues to improve our gaming pleasure! The second gaming platform is the good old download which is becoming less popular as instant play becomes more popular. The third great gaming platform is the Slots Capital Mobile Casino. This is quickly becoming the most popular platform of all because of its easy accessibility and convenience. And just as instant play is better than it has ever been because of improvements in graphics, this is even more pronounced on Slots Capital’s mobile platform! The modern mobile platform at Slots Capital has a broad selection of games and allows you to take part in every promotion offered at the desktop casino. And the casino is always with you so you can play when and where you want. The games at Slots Capitol Casino are provided by Rival Gaming. Rival Gaming is famous for their I-Slots which are interactive slots where the story develops as you play the game. Because every spin is random, thanks to the RNG, the game often unfolds differently every time you play it. Some have derided this feature as a mere gimmick designed to keep players playing. We say anything that entertains is likely to be good. Two of the best I-Slots are Bank Heist and its follow-up I-Slot Art Heist. In each, you play detective as you venture forth to solve the mystery. These games make it clear why veteran gamers love to combine the mystery-solving urge with online slots fun. The extremely high quality of animation in the I-Slots makes them especially realistic. In reality every slot and all the other games at Slots Capital have great graphics as well. The graphics draw out the story particularly well in the I-Slots. Slots Capital features many slots in addition to its collection of I-Slots. Modern slots are story-driven five reel games. Each game has a unique storyline with characters drawn especially for that game. Video slots also have many characteristics in common such as wild symbols, bonus rounds with free spins, scatter symbols, multipliers, stacked reels, cascading reels, nudges, frozen wilds, and others all of which are designed to maximize your winning chances. The average payout rate for the approximately 100 slots at Slots Capital is about 97% so you can easily see why we call online slots at Slots Capital primarily a great form of entertainment. The casino adds one or more slots every month and you can read all about these new games at Slots Lotty’s Blog. Slots Capital offers a fine selection of table games including blackjack, roulette, craps, and baccarat. Blackjack players will enjoy three-hand blackjack as it gives you the chance to use the best playing strategy and increase your winning chances. Blackjack has numerous variations in the rules so we urge players to learn each game well before betting real money on the outcomes. This points to the great advantage of online gaming over land based gaming: in online gaming such as at Slots Capital, you can play in free play mode as long as you wish in order to get a good feel for the game. Two newer table games that many players have yet to try out are Red Dog and Pai Gow poker. The casino offers both American Roulette and European Roulette. We always recommend that players choose the latter. This is because European Roulette has only the 0 while American Roulette has 0 and 00. The house advantage in European Roulette is only about 2.5% while it is twice that in American Roulette. Roulette and craps are two table games that are much more popular at land based casinos than at online casinos. Apparently, players really enjoy the noise they and the other players make around the craps and roulette tables. Nevertheless, these games at Slots Capital have fine graphics and offer a realistic gaming version. If you play roulette, whether at a land based casino or at an online casino, we urge you to learn all of the different bets you can make and find your comfort zone of bets. The Random Number Generator means that there is absolutely no such thing as a number that is “due” to come up. This is a great variation of poker and it’s extremely well-suited for online gaming. It is most often a form of five card draw poker in which you play against the pay table. The dealer never even takes a card and never plays a hand against you. Simply put, whichever variation you play, you have to get a minimum hand to win. Video poker has very high payout rates; close to 99%. Since every hand requires a strategic decision from you, we encourage players to use a strategy card. If you do and you’re lucky you’ll win quite often and have a great poker time in the process. The strategy card in video poker is a bit strange for most players at first. It involves choosing he highest hand you can achieve with a draw to the cards you’re holding. An example is if you have four cards of the same suit, called four to a flush, two high cards in the same suit which could become anywhere from a high pair which would probably win to a Royal Flush which would win really big, or a low pair which could become three of a kind up to four of a kind or a full house. Best strategy calls for playing for the flush. You don’t have a reasonable chance for a Royal Flush or a full house and your chances of a flush are better than three of a kind. Here is another piece of advice: When you play video poker, you can win the big prize only if you bet the maximum. So keep that in mind and choose a video poker game with a maximum bet that is in line with your gaming and entertainment budget. Specialty games include the four most common bingo types plus sudoko, keno, and a large selection of easy-going fun games with super animation. A lot of players go to the specialty games when they want to take a break from the more standard games. The casino runs five progressive jackpot games. These jackpots can reach stratospheric heights although they are designed to be won sooner than the progressives from other developers and featured at other casinos. You can win the big progressive jackpots only with a maximum bet so the advice we gave in the section on video poker applies here as well; choose a game that fits your gaming budget. It could be that you’ll be better off in terms of playing time and entertainment value if you play non-progressive games. 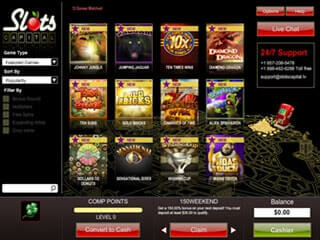 Slots Capital offers at least nine different bonus deals. Every day they offer one and then they add new bonus offers as the week goes on. They also combine their weekly bonus promotion with a chance to receive free casino chips. One aspect of all casino bonuses is what Slots Capital calls “rollover”. We spoke about the rollover requirement above. Whereas some casinos regularly have rollover rates of 50x, which is very high, Slots Capital normally has rollover rates of only 30x. They also have two great bonus offers with super low rollover rates. The daily 65 Easy Win bonus has a 16x rate and the Easy Sunday 100% bonus has 20x rate. Slots Capital also has ways to return money to you so you can play longer and possibly win the big one. The Friday Free Ticket promotion returns casino credits based on how much your net loss was during the week. The casino always hopes you win but if you’ve lost, say, $100, you’ll get a $20 gift certificate to play with. Similarly, if you are a VIP and play on the weekend with a net loss, you’ll get a cash back return. The percentage return is determined by the size of your loss and your VIP status. Everyone gets Comp Points for each wager. These points can be converted to casino credits and those with the largest number of Comp Points are designated as VIPs. Among the many benefits of being a VIP is that your Comp Point conversion scale is multiplied from twice to eight times, based on your VIP status. It’s easy to join the VIP Club: you need to have an active account for thirty days and send the casino some documents for your and the casino’s security. As you play, you’ll collect comp points. You can rise from level to level in the VIP Club, all the while getting better cash back benefits, better bonuses, lower rollover requirements, free gifts, and more. If you have any question at all, the team at the customer service desk is ready to answer you. You can get hold of a service representative by telephone, email, or chat. The office runs on a 24/7365 basis. We said at the outset that Slots Capital is a thoroughly modern online casino with a friendly 1950’s atmosphere, led by Slots Lotty. We hope that as you read our Slots CapitalReview, you got the same feeling that we get whenever we enter the casino: that it successfully bridges the sense of a simpler time in the past with the best that modern casino technology and service values can offer. So, try out Slots Capital now. We expect that you’ll be happy you did.